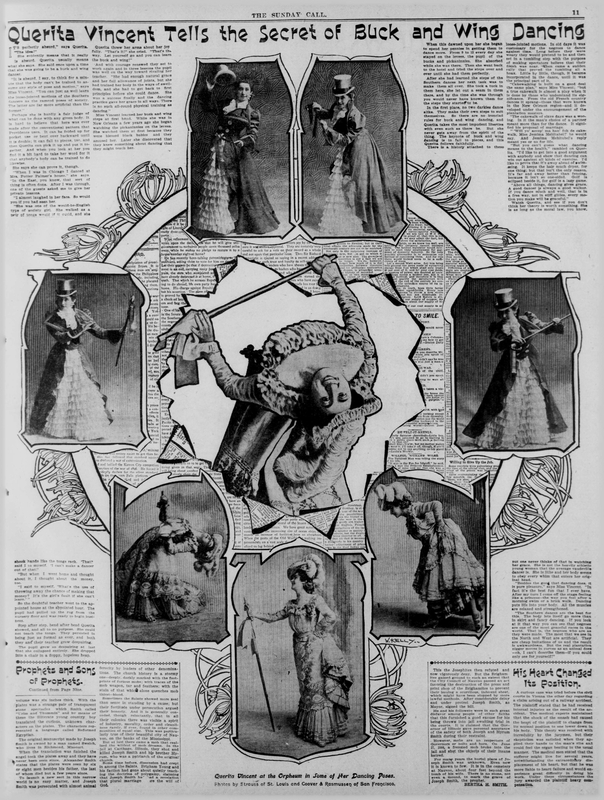 Jerome H. Remick & Co. published a piece of sheet music entitled “Texas Tommy Swing” by Val Harris and Sid Brown, as featured by the Ziegfeld Follies of 1911. It is also available at the National Jukebox. The lyrics reference a dance called the “Buck and Wing.” A little research into the Buck and Wing reveals it to have a complicated history, with ties to early tap and clogging, as well as to minstrel and vaudeville shoes. It is deserving of its own article, something that has been attempted at StreetSwing. Professor DeFrantz states, “Black social dances in the Americas…developed after the middle passage when African Americans had to figure out ways to kind of be outside of the controlling eye of the clergy. A lot of these dances were forms that were restricted by white slaveholders who were really only interested in dances that were easily identified as being Christian movement.” According to Professor DeFrantz, “Buck dances were forms that were very very percussive and weighted down into the foot.” Wing dances, on the other hand, are “where you literally flap parts of your body as if they were wings.” He provides a demonstration of both movements. Ms. Vincent appears to have been a vaudeville performer on the Orpheum circuit who performed in minstrel shows. She died of consumption in 1902. All of this is to say that when Mr. Harris and Mr. Brown referenced “Buck and Wing” movement in their description of the Texas Tommy, they may have been attempting to attribute a looseness of limbs and a grounded, syncopation of feet to the dance’s stylings. Or they may have been obliquely referencing the dance’s African American roots. This sheet music was provided by the Mississippi State University Digital Library. The article was provided by Chronicling America.